18 Talking to the "World"
Bennie G. Thompson is a Democratic member of the United States House of Representatives, representing the 2nd district of Mississippi. As a young man growing up in rural Bolton, Mississippi, Thompson was well aware of the realities that plagued the South. The experiences that his family endured made him determined to be an advocate for those of who were oftentimes underserved. While earning his Bachelor of Science and Masters of Science degrees from Tougaloo College and Jackson State University, respectively, Thompson began to develop his grassroots political activism. He joined the Student Nonviolent Coordinating Committee , and helped to organize voter registration drives for African-Americans in the Mississippi Delta. As a product of the Civil Rights Movement, Thompson has remained committed to ensuring that all people are allowed to exercise their fundamental rights. After graduating from college, Thompson followed in the footsteps of his mother and worked as a schoolteacher. It was during this time that he began to aggressively pursue a career in politics. From 1968 to 1972, Thompson served as alderman, and he went on to serve as mayor from 1973 to 1980 in Bolton, Mississippi. As mayor of Bolton, Mississippi and founding member and President of the Mississippi Association of Black Mayors, he initiated policies and provided services that benefited the underserved citizens of his hometown. In 1975, having firsthand knowledge of the disparity between funding, equipment, and supplies provided to historically black universities and those provided to white colleges, Thompson filed a lawsuit to increase funding at Mississippi’s historically black universities. With Thompson as lead plaintiff, the case was subsequently settled for an unprecedented $503 million. From 1980 to 1993, Thompson served as County Supervisor for Hinds County and was the founding member and President of the state’s Association of Black Supervisors. His reputation of being a pragmatic local public servant afforded him an opportunity to be the vocal champion for his constituents. On May 5 1984, at the Mississippi Democratic Party convention, Bennie Thompson was elected to the DNC. An early Jesse Jackson supporter, Thompson had the support of all the Jackson delegates. Reporting on the event for the Communist Workers Party's Workers Viewpoint, Mike Alexander described Thompson as a "genuinely progressive, honest young politician, who can be counted on not to sell his people out". Hollis Watkins was involved in managing, advising and working on many political campaigns, including the 1967 campaign for Robert Clark to become the first African-American elected to the Mississippi State Legislature since Reconstruction, both Presidential Campaigns of Rev. Jesse Jackson, the 1986 campaign of Mike Espy who was elected as the first African-American Congressman, and the 1993 campaign of Congressman Bennie Thompson. In 1993, Thompson was elected the Democratic Congressman for Mississippi’s Second District. Congressman Thompson’s Second District is comprised of 23 counties – Attala, Bolivar, Carroll, Claiborne, Coahoma, Copiah, Hinds, Holmes, Humphreys, Issaquena, Jefferson, Leake, Leflore, Madison, Montgomery, Quitman, Sharkey, Sunflower, Tallahatchie, Tunica, Warren, Washington, and Yazoo. In 2000, Thompson authored legislation creating the National Center for Minority Health and Health Care Disparities, which subsequently became law. He received a Presidential appointment to serve on the National Council on Health Planning and Development. In 2006, during the 109th Congress, Thompson’s Washington colleagues "expressed their overwhelming confidence in his abilities", as they promoted him to serve as the first Democratic Chairman of the Homeland Security Committee. As Chairman, Congressman Thompson introduced and engineered House passage of the most comprehensive homeland security package since September 11, 2001 - H.R. 1, the “9/11 Commission Recommendations Act of 2007”. Congressman Thompson’s reputation as a no-nonsense visionary has provided him an opportunity to serve his third term as Chairman. Workshops included "Relating Local Issues to the Democratic Party" - Michael Bleicher, moderator; Reba Brown, Ruth Messinger, Mary Sansone, Bennie Thompson. National endorsers of the event included Bennie Thompson - Hinds County Supervisor, Mississippi . 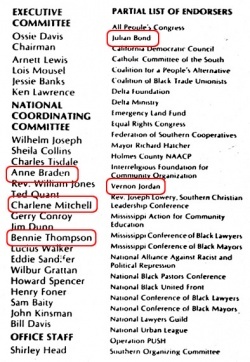 In July 1996, the Democratic Socialists of America Political Action Committee endorsed Bennie Thompson, Mississippi 2, in that year's Congressional elections. 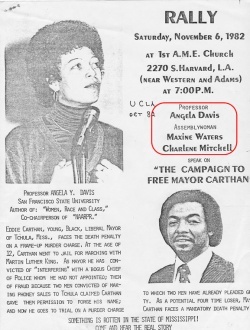 In 1982 Bennie Thompson served on the National Coordinating Committee of a Communist Party USA front the National Alliance Against Racist and Political Repression, which was led by leading Party members Angela Davis and Charlene Mitchell. In 1998 Bennie Thompson Democrat was listed as a member of the Congressional Progressive Caucus. As of February 20 2009 Bennie Thompson was listed as a member of the Congressional Progressive Caucus. In February 2000, Marsha McCraven from the office of Congressman Bennie Thompson spent five days in Havana, Cuba, for the purpose of "information gathering". The trip cost $1,778.47 and was paid for by the Christopher Reynolds Foundation. "The advantage is that you graduate a bilingual doctor and there are so many communities in the United States where this is such an important (asset)," said Ellen Bernstein, associate director of the Interreligious Foundation for Community Organization, the New York-based group that helps screen applicants for the program. Nine U.S. students have graduated and 105 are enrolled in the six-year program now. None is from Mississippi, where the state Health Department's Policy and Planning Office says every county in the state is medically underserved to some degree. Hoping to entice a few students from the Magnolia State, Thompson will be in Itta Bena Saturday hosting A Dream of A Lifetime Conference, which will educate high school and college students about going to the Latin American School of Medical Sciences in Cuba. Previous recruiting efforts in Mississippi consisted of sending mailings to schools, Thompson said. The U.S. maintains a trade embargo that prevents selling certain products to Cuba, and relations between the two governments remain icy, but the free medical education is unaffected by the countries' political relations, Thompson said. The Association of American Medical Colleges earlier this year estimated the medical class of 2007 has an average student loan debt of more than $139,000, including undergraduate years. That student loan payment equates to more than $2,000 a month with a 6.8 percent interest rate. "Here's an opportunity to get a degree and start off not owing anyone," Thompson said. At Saturday's program, potential students will hear from two U.S. students enrolled at the Cuban medical school: Keasha Guerrier, a 23-year-old from Long Island, New York, and Akua Brown, a 32-year-old from San Francisco. The women, who just completed their third year of medical school, are working with Dr. Luke Lampton, a Magnolia family practice physician who also is chairman of the state Board of Health. "Their clinical knowledge is comparable to the United States' medical students at this stage," Lampton said. "What impresses me most about these students is their courage and their boldness in trying to study medicine in a foreign language. Medical school is hard enough if you don't have to take classes in Spanish." Brown and Guerrier speak very highly of the program they learned about on National Public Radio, but they've had to make some adjustments. Both natives of metropolitan areas, they were not used to life without plentiful public transportation, stores that don't have extended hours and not being able to buy fruits and vegetables outside their natural growing seasons. Congressman Thompson’s visit to Cuba in June 2000, paved the way to exploring the possibility of trading agricultural and medical products with the communist state. In addition, he has sought to explore medical education and training opportunities that may exist for Second District students in Cuba. Hon. Bennie Thompson, U.S. House of Representatives, Mississippi. Mississippi farmers hoping to give Cubans a taste for catfish and other local delicacies are heading to the island nation this June. Second District Rep. Bennie Thompson, who visited Cuba in 2000, will lead the group heading Wednesday to Havana on a five-day trip to drum up business with the government of Fidel Castro. "If we aren't lucky with our individual pursuits, at least we can bring back a little knowledge," said Dickie Stevens, part owner of Isola-based Confish Inc., the largest fish processor in Mississippi. Also planning to travel to Cuba are Isaac Byrd, a Jackson lawyer and soybean farmer; Leflore County Board of Supervisors President Robert Moore; Sykes Sturdivant, whose family owns a cotton and corn farm in Glendora; Mike Wagner, owner of a rice, corn and soybean farm in Sumner; and Danny Brookins, an exporter who has a business in Biloxi. Except for Thompson, members of the delegation are paying their own way to Havana. The New York-based Christopher Reynolds Foundation, a nonprofit that funds projects aimed at improving U.S.-Cuba relations, is paying Thompson's travel costs. Thompson said he discovered a new market for farmers in his Delta-based district during his first trip to Cuba. "Agriculture is the second-leading income producer in my district next to gaming," said Thompson, a Democrat. "There are some opportunities for us in a country that is so close to our borders." The delegation hopes to meet with top Cuban officials, including Castro, visit a Cuban farm and tour historic old Havana. "I got invited by a group called Pastors for Peace," said Representative Bennie Thompson. The Congressman has visited Cuba five times since 2000, taking corn and rice farmers who were interested in trade on previous trips. He says the Cubans are receptive and both countries could share research, educational and business opportunities after five decades. In May 2005, Congressman Bennie G. Thompson and two of his staff members, Timla Washington and Steve Gavin spent four days in Havana, Cuba, for the purpose of "Cuba business, fact finding". The trip cost $1,298.26 and was paid for by the Christopher Reynolds Foundation. The Coalition of Black Trade Unionists held their 34th annual CBTU convention in Tucson, May 26 2005. Rep. Bennie Thompson was one of the speakers from the May 22 opening session. He was introduced by Tony Hill of Florida, a Communist Party supporter. Guest speakers include Randi Weingarten, president of the American Federation of Teachers, Rep. Bennie Thompson (D-MS), ranking member of the House Committee on Homeland Security, and Larry Rousseau, executive vice president, Public Service Alliance of Canada. CBTU President Emeritus William Lucy will be the special keynote speaker at CBTU’s Awards Banquet. Rep. Bennie Thompson addressed the May 2015 Coalition of Black Trade Unionists National Convention in Chicago. Bennie G. Thompson signed the letter. In mid May 2013 Rep. Bennie Thompson spent a day campaigning with Jackson Mississippi mayoral candidate Chokwe Lumumba around the city. He was also joined by former candidate Regina Quinn, Sen. Sollie Norwood (D- Jackson), Supervisor Kenny Stokes and Councilwomaman Larita Cooper-Stokes. In the past week, we’ve seen a slew of endorsements between both Jackson mayoral candidates Councilman Chokwe Lumumba and Jonathan Lee. There is no question that the most prized endorsement belonged to Second District Congressman Bennie Thompson of Bolton. In this 1 minute radio ad that features the congressman’s very familiar hook “He’s the one we need”, Rep. Thompson skewers Lee by tying him to Rankin and Madison County Republicans and referring to Councilman Lumumba as “the real Democrat” in the race. I’m certain that all of the candidates sought the endorsement of Congressman Thompson but now that he has thrown his support behind Chokwe Lumumba, it will be interesting to see if it will close the gap and and change the trajectory of the race. Circa June 18, Jackson Mayor-elect Chokwe Lumumba announced the members of an advisory committee that will help ease his transition into the mayor’s office in July. Akil Bakari, managing partner for Expert Professionals Solutions, LLC. Michael Thomas, vice-president of finance at JSU. On March 8 2014, hundreds of people, especially from the South and particularly Jackson, Miss., came to mourn and reflect on the life of Mayor Chokwe Lumumba, who died suddenly on Feb. 25 at the age of 66. Starting with a March 5 tribute at the historically Black college, Jackson State University, Mayor Lumumba’s life was memorialized for several days, ending with the masses lining the streets for his burial motorcade. People gathered for the “Home Going Ceremony” in the main room in the Jackson Convention Complex, with hundreds more in an overflow area. They were regaled for hours with stories of a young Chokwe, before he took the name honoring an African people who resisted slavery, the Chokwe of Central Africa, together with the name of the great anti-imperialist Patrice Lumumba, the first elected Prime Minister of Congo assassinated at the behest of the CIA in 1961. Besides his son, Chokwe Antar Lumumba, and daughter, Rukia Lumumba, those on the program included Myrlie Evers-Williams, widow of slain NAACP leader, Medgar Evers; Civil Rights leader Hollis Watkins; Congressperson Bennie Thompson; interim Jackson Mayor Charles Tillman; former Mississippi Gov. William Winter; and singer Cassandra Wilson. Nation of Islam leader Louis Farrakhan sent a condolences statement. Signatories included Rep. Bennie Thompson. The Alliance for Retired Americans Political Action Fund endorsed Bennie G. Thompson in 2014, also 2012. With Latrice Westbrooks, Jaribu Hill, Bailey Willie, Congressman Bennie G. Thompson and Lois Hawkins. Ricardo Briones, Southwest Workers Union - San Antonio, Marilyn L. Young - Tunica, MS, Rep. Bennie Thompson, Brenda Hyde - Southern Echo, Inc. and Leroy Johnson - Southern Echo lead off Voting Rights Act Anniversary Convening in Jackson, MS South X Southwest Experiment — in Madison, Mississippi. Dozens of Mississippians protested outside the U.S. Capitol on Flag Day, June 2016 , hoping to generate enough national support to pressure Mississippi lawmakers to change the state flag, the only one in the country that still features the emblem of the Confederacy. Critics of the flag say it's a symbol of hate and a reminder of the South's segregationist past. Jackson Mississippi Mayor Chokwe Antar Lumumba, and Congressman Hakeem Jeffries also spoke. Students from colleges such as Tougaloo and Jackson State also made the trip to Washington. Congressman Bennie Thompson, at the January 2017 Jackson Community Kwanzaa Celebration, encouraged citizens to retain hope in the face of the swearing-in of Donald Trump. He reminded them that they and their ancestors survived slavery, segregation and Jim Crow; the administrations of Richard Nixon, Ronald Reagan and George Bush I and II. At the state level, Congressman Thompson and Chokwe Antar Lumumba, speaking to the crowd at the Medgar Evers Community Center, underscored the attacks of the Republican dominated government on (1) Jackson Public Schools and public schools in general, through underfunding and the multiplication of charter schools, (2) Jackson's airport, and (3) the governance of Jackson's Capitol Complex. (Thompson also referenced the attempt to convict Hinds County District Attorney Robert Shuler Smith as a part of the attack on black people in the Jackson and Hinds County area.) All of them also indicated that there is probably more to come in the new session. Chokwe Antar Lumumba, Jackson, Mississippi’s revolutionary mayor, would not be sharing the stage with President Donald Trump at the grand opening of the Mississippi Civil Rights Museum this December 9 2017. Trump will no longer be speaking at the museum opening—since the announcement that he would was met with justifiable rage and disgust—but he will still be in attendance. To add further insult to injury, Lumumba learned that he would also not have the opportunity to speak at the historic event. Instead, Lumumba will hold a press conference with U.S. Rep. Bennie Thompson (D-Miss.) and NAACP President Derrick Johnson. The conference will take place at the same time as the museum opening. U.S. Rep. John Lewis (D-Ga.), will also not be in attendance because of Trump’s "toxic" presence. “President Trump’s attendance and his hurtful policies are an insult to the people portrayed in this civil rights museum,” Thompson and Lewis said in a joint statement. ↑ CubaNet, Thompson to lead business group to Cuba By Ana Radelat, Clarion-Ledger, Washington Bureau. May 31, 2005.